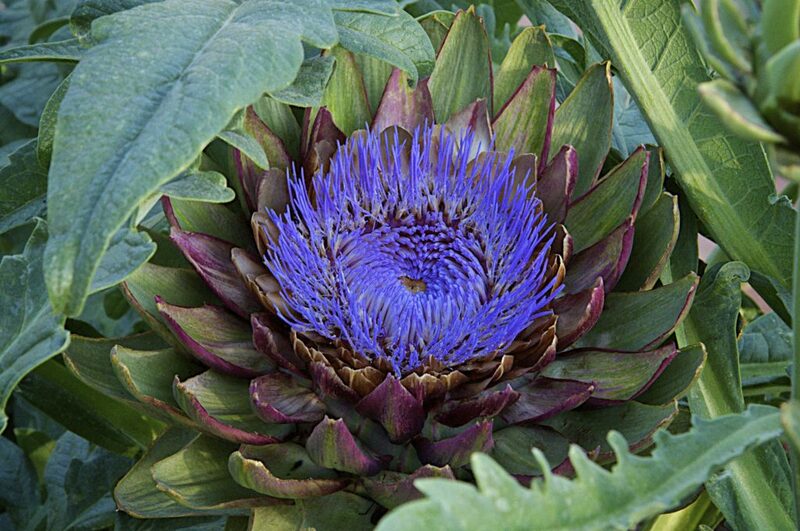 Late last November I planted two Artichoke plants in a sunny spot in one of my new flower beds. I wanted something to grow fast and add some variety of color and shape to my view. They grew beautifully! By March their silvery-green leaves spiked up vigorously at both ends of the bed providing a framework for the smaller plants between them. 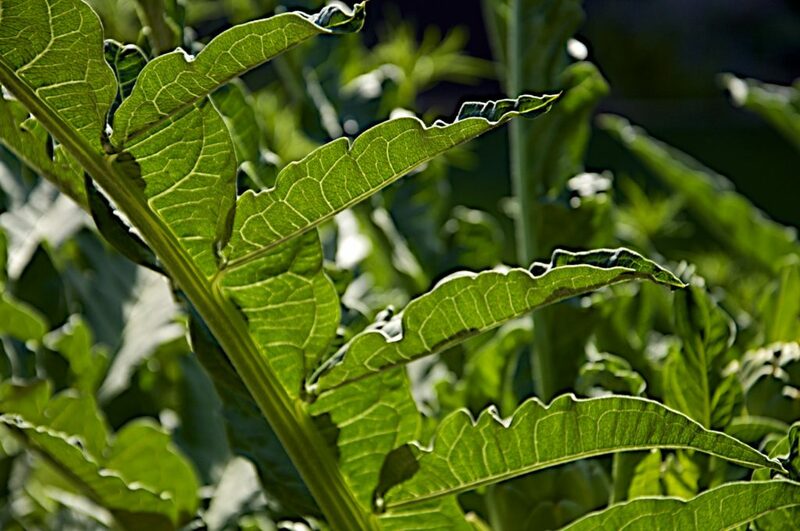 The end of each symmetrical leaf was punctuated with a fine thistle tip. 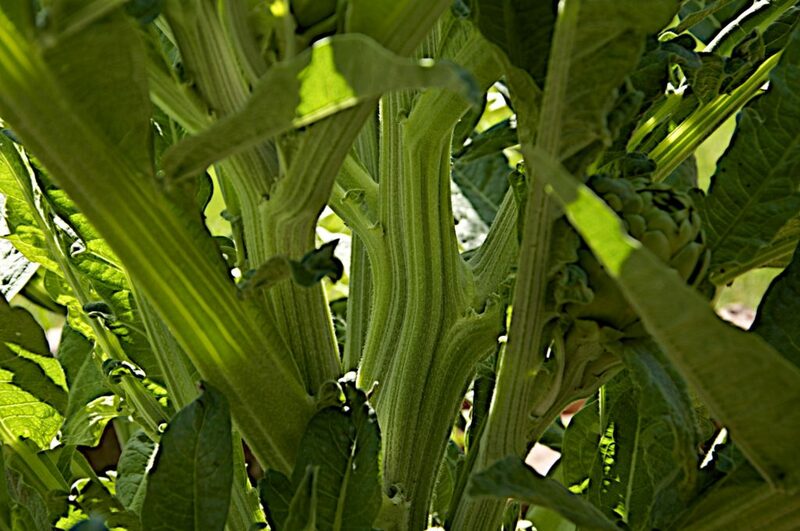 Water filled stalks with strong ribs in a soft shade of green provided the support for the many leaves. Visions of artichokes and cheese sauce came to mind! Then a visitor walked through my garden. Prem, a passionate gardener all the way down to his toes, is also a retired nuclear inspector for the state of Arizona, but gardening brings him joy. He enjoyed everything in the garden and complemented many of the plants and features he was seeing for the first time. When he arrived at my artichoke plant he stopped. He cradled the bud in his hands, then turned to me, looked deeply into my eyes and said, “You must promise me you won’t cut this to eat.” I looked at him in a quizzical way and he continued, “This will make such a beautiful flower. You will break my heart if you do not let this grow into flowers. If you want an artichoke to eat you can buy one at the market. Promise me you won’t cut this.” What could I say to such an impassioned plea? I agreed to let them grow. The two plants grew nearly 4’ high and 5’ wide. The buds expanded and the outer bracts peeled back tinged with shades of purple. The fuzzy hairs of the inner choke rose up to the sun and opened in bright purple hairs. The purple centers were soon attracting bees! The growing conditions for the plants must have been simply perfect as the plants grew and grew, with new buds forming all over. One plant had over 25 buds, growing so heavy it began to tilt to its side. The buds all opened and the plant was full of color, beautiful from the front and equally wonderful from the back. 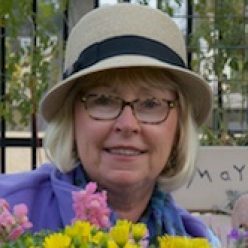 Mid June I decided to cut the flowers from the plant that had tilted over from its own weight. I carefully cut each one with as long a stem as I could. 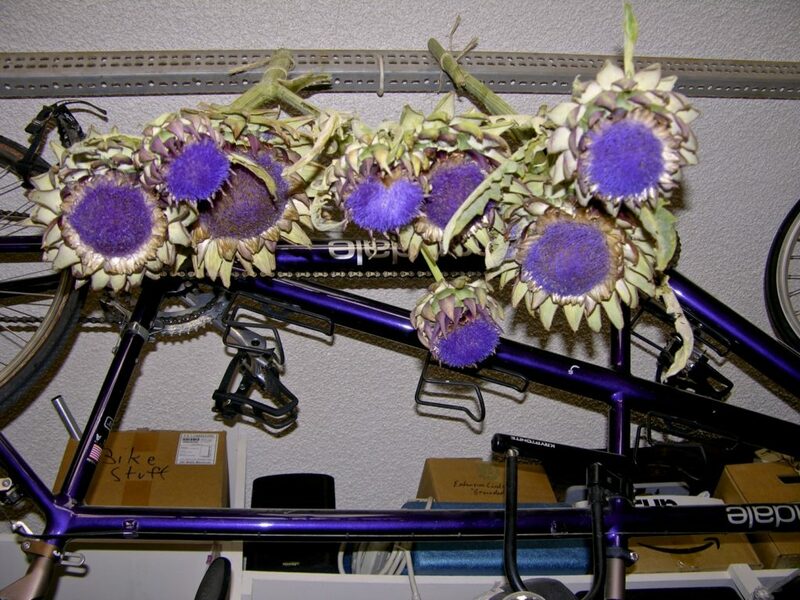 The flowers were still bright purple and needed to dry so we hung them in the garage by their stems to let them finish. The other plant was still upright so I decided to let it dry in the garden. 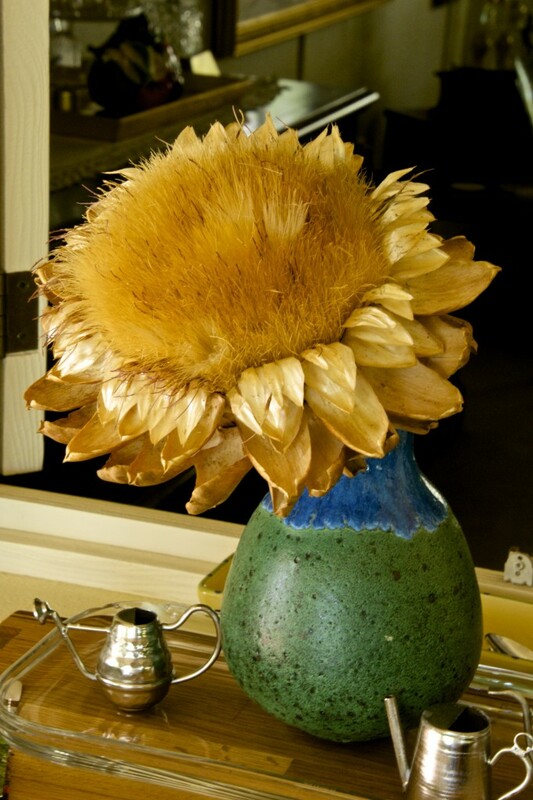 We left on vacation and when I returned after five weeks the artichoke flowers had dried in the sun to a deep golden color. I cut these in early August and put them in my garden shed. 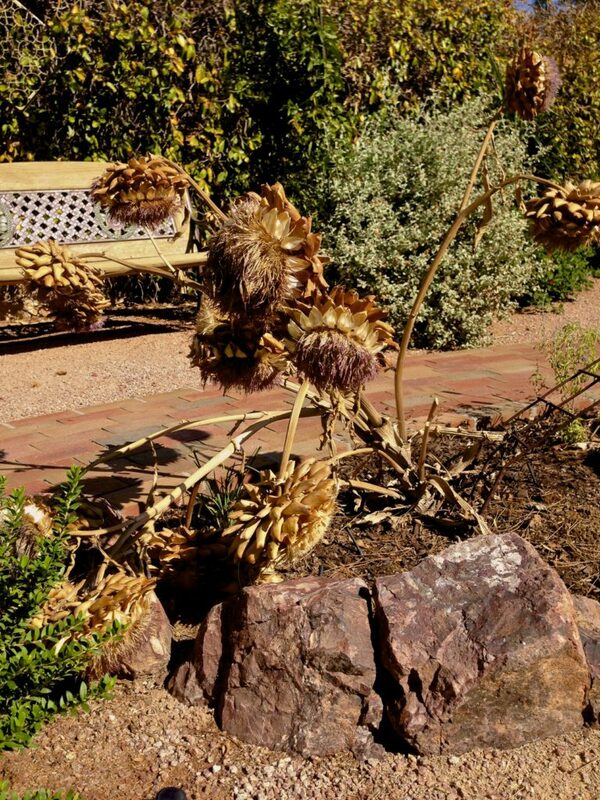 Some of the blooms had become a bit dirty and smashed from the many days in the sun and weather. 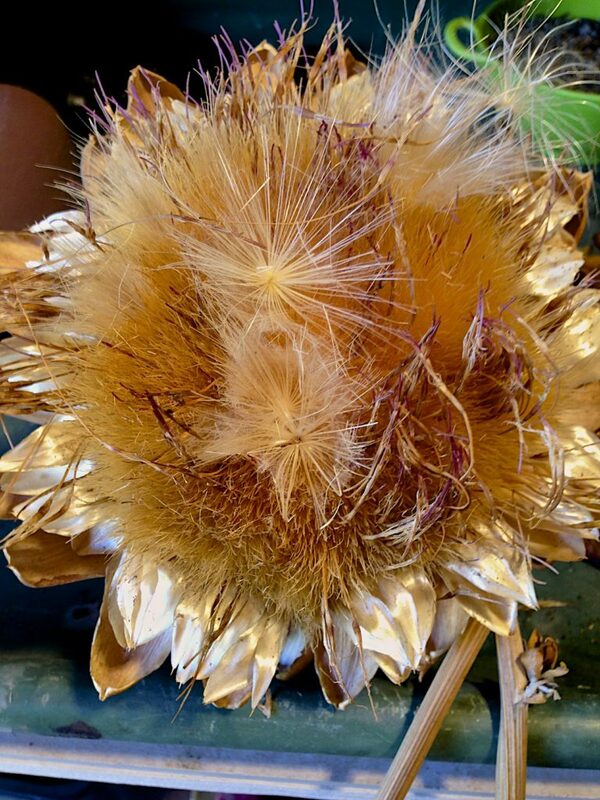 I decided to pull some of the dirty hairs from the center of the flower, they released easily, and what remained was a bright yellow bloom. It is amazing to realize that each of those hairs creates a parachute for a seed to grow another plant. My two plants, started from 4” pots, produced over 50 flowers, some as large as 10” in diameter, others 3-4” in size. All are quite beautiful. Just one bloom is a stunning sight. 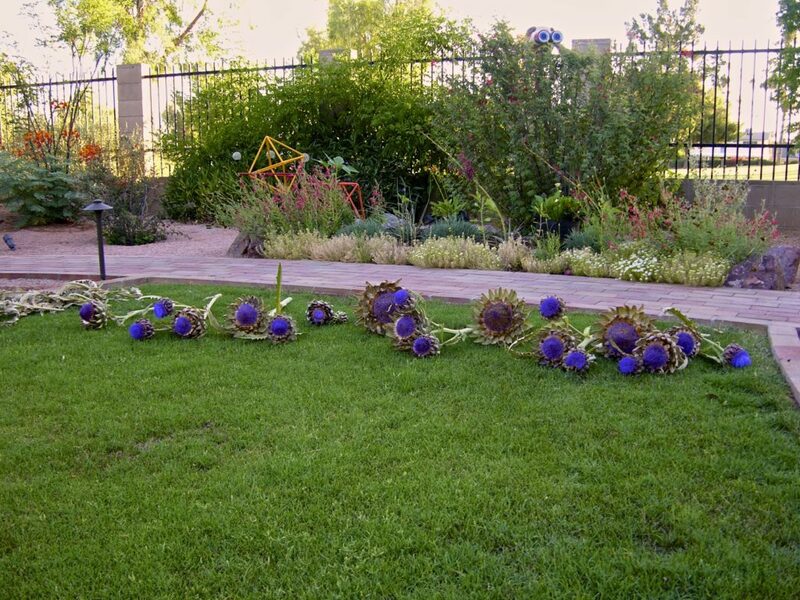 The artichoke project entertained me for eight months in the garden and produced beautiful flower stalks to enjoy for months to come. Today there is renewed passion for growing our food, gardeners are eager to grow vegetables and fruits. It is exciting to produce watermelon, onions, tomatoes, any number of tasty vegetables. 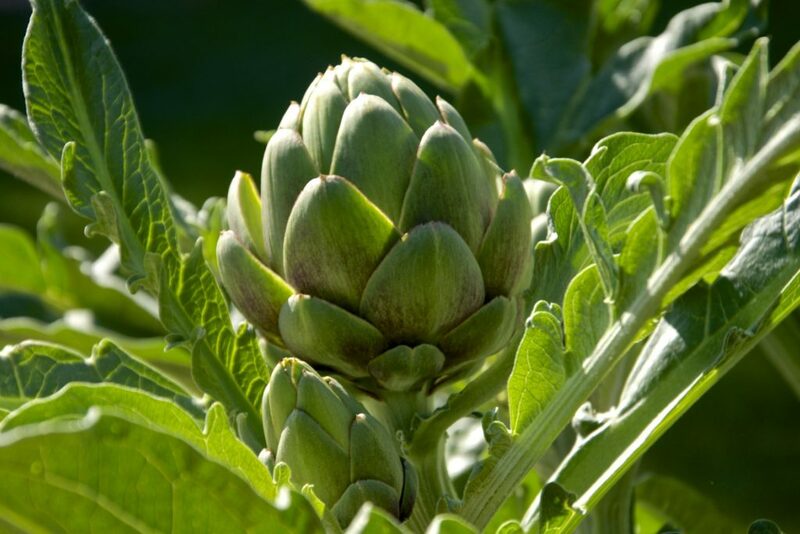 In my artichoke project I was aiming for food, but in resisting my desire for the food for the body, I let the plant produce flowers which creates food for my soul. 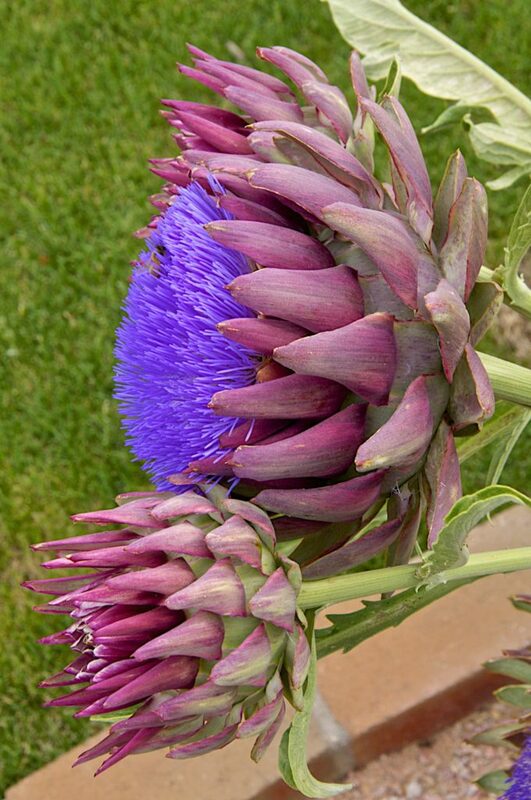 Now I am looking for friends who would like an artichoke flower! Bravo!!!! Please count me among your friends who would like a bloom? 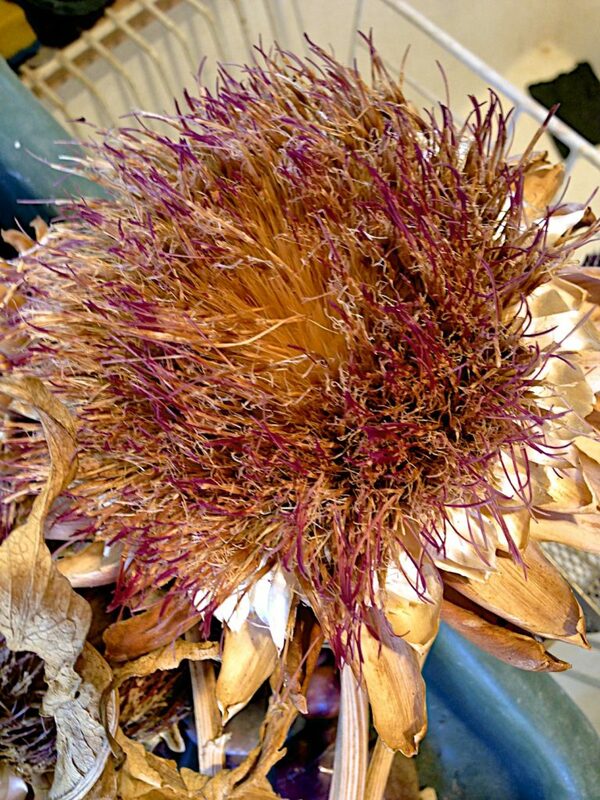 How does one get seeds for artichoke and where do you live? I live on the east coast( Rhode Island) would I be able to plant in the Fall? 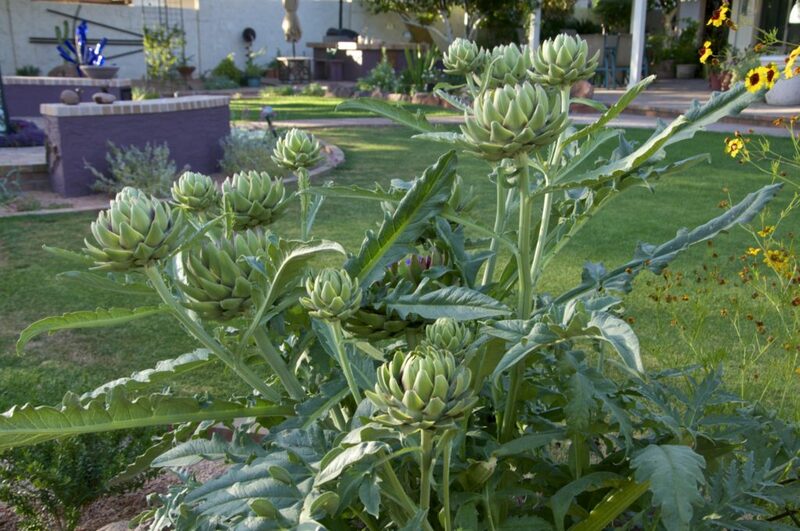 My garden is in AZ and the artichokes grow easily here. I buy them as a start from the nursery. 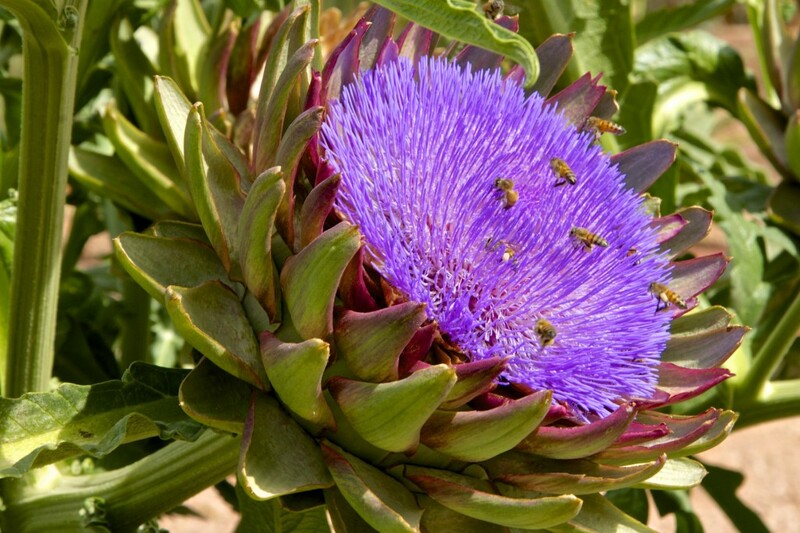 CA grows masses of our artichokes, for consumption. I’m not sure your climate will be conducive to growing them. The season is not likely long enough. I’ve seen them grown as feature plants in mass groupings just for the foliage. How wonderful! I’ve tried to grow these and have not had any success. I’ll keep trying because I, too, have fallen in love with the blooms. Thanks for inspiring me.